I can't say what your problem is, but are you sure that you have connected the "commencement of injection" solenoid. The other one limits the max fuelling or something like that, and if you had that one connected, it definitely wouldn't produce the right results. The other thing you could check is that the timing is spot on. Small errors can have a surprisingly large effect. Did you say that the engine was fitted when you got the van? Only guessing here, but whoever fitted it would have had a pretty bad white smoke problem on cold starting without that solenoid connected. They might well have advanced the injection to improve things, in which case the"commencement of injection" solenoid might be advancing things a bit too much. In that case you might have to retard the injection on the pump just a smidge. Just small changes to see what happens. As I said, I'm only guessing really. Ah ok that could be it. yes the engine was already in when I bought the van but it would never start very well until I either removed the fuel pump and disconnected the AoF solenoid. so big question is can I adjust the injection myself or is it a garage job. If I can do it myself then how do I do it. Ideally you'll need a VW cambelt timing tool set. They aren't expensive, but you can do it without. When you can insert a 6mm (or could be 8mm?) dowel through the hole in the pulley boss , and into the hole in the hub, the pump is set at exactly TDC (like the one in the photo). You can use the plain end of a drill bit. Obviously if everything is OK, then the crank will be at TDC as well. If the crank is at TDC you'll be able to insert the crank timing tool. 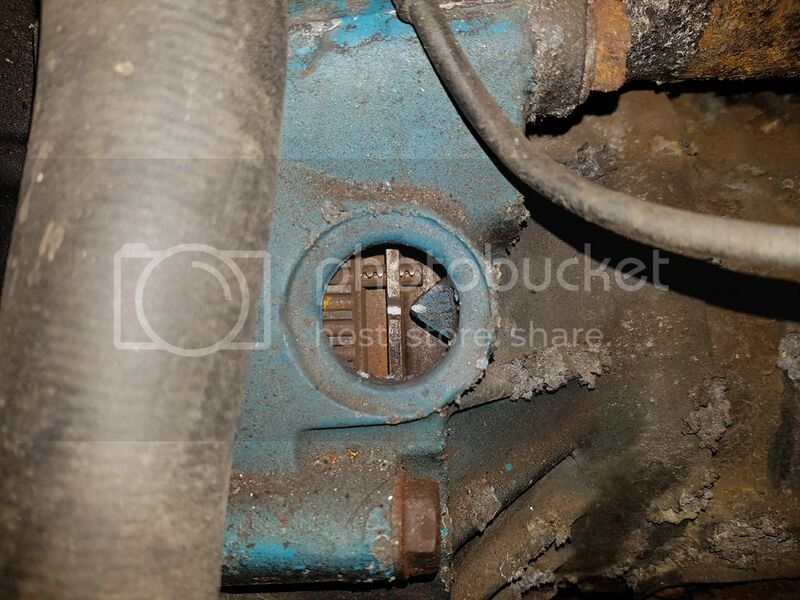 (Or you can look through the hole in the bellhousing for the mark on the clutch cover). If it's not, with the pump locked as above, slacken the three bolts holding the pulley on to the boss one quarter turn max NOT THE CENTRAL NUT!!! !, and move the crank until it's at exactly TDC. Now tighten the three bolts to 25Nm, rotate the engine two turns by hand in a clockwise direction and check it all again. You'll have to counterhold the pump pulley to slacken and tighten the bolts. I use a piece of metal with two bolts through it. You will be able to tell if the timing has been altered, because just like in the photo, you can see the shadows of the original bolt positions, so naturally the bolts should cover the shadows exactly. While you're in there you might as well check that the cam is at TDC as well. The tools to do that should be part of the cambelt timing kit. Plenty of instructions on here and t'interweb for that job. I've never needed anything but the original factory setting. I figure they would have got it right! Top tip for this job is to attach a long length of bright ribbon to the dowel, to remind you it's in there, just like aircraft techs do. colinthefox wrote: Top tip for this job is to attach a long length of bright ribbon to the dowel, to remind you it's in there, just like aircraft techs do. I must admit that I have bent one in the past by forgetting it! Oldiebut goodie wrote: I must admit that I have bent one in the past by forgetting it! I have rotated the bell housing to TDC and I have taken a picture of that I have. It looks a mess where it has been adjusted before. Can you tell me if I am in the right position to adjust the timing or does it look like it needs it. It still won't start with the commencement of fuel solenoid connected. What are all those white marks for? The dowel will only go in at one position. Why not follow the procedure as detailed above rather than try to devise an alternative method? I only have the fuel stop solenoid connected on my 1Y - all the the other electrical connections to the pump have been removed. Cold start by cable now as per original JX and CS engines. The white marks were all there before ! There is only one hole for the dowel to go into. Likewise the cam locking tool will only fit in one position. With those two in the correct position then check that the clutch plate mark is still lined up with the pointer. Once all in the correct places put the cam belt on. Ensure that the belt is tight at all points other than the tensioner position. As Colin says once they are set as per factory there is usually little need for further adjustment. I have checked everything and it all seems ok, set up wise that is. It is still not starting with the commencement of fuel solenoid connected, but it will start with it not. It runs a bit ropey to start with and give a little white smoke but then clears ok.
Do you still have the cold start cable fitted in position, just not connected at the pump? If so it may well be worth just putting it back so that you choose when to utilize it. As I said I have done away with all extraneous electrical gubbins from my pump. No problems with starting/white smoke etc. Rarely need to use the cold start. Why are you so set upon having that solenoid connected? Was the cam locking tool correctly fitted, ensuring that the same size feeler gauge is taking up the slack each side of the tool prior to the fitting of the cam belt? Have all the glow plugs been checked? The white smoke could be due to you only having only one or two functioning. I just want the engine to fire up every time and without the spluttering at the start. I thought that the solenoid would solve that. I don't have any cables that I know of with the cold start so I'm not sure. I have the same set up as colinthefox so I was going by his guide. ObG. This is an AEF engine we're talking about here. It doesn't have a cold start cable at all. It has a Lucas pump with a "commencement of injection" solenoid which does exactly the same function as the cold start cable on a Bosch pump but electrically. 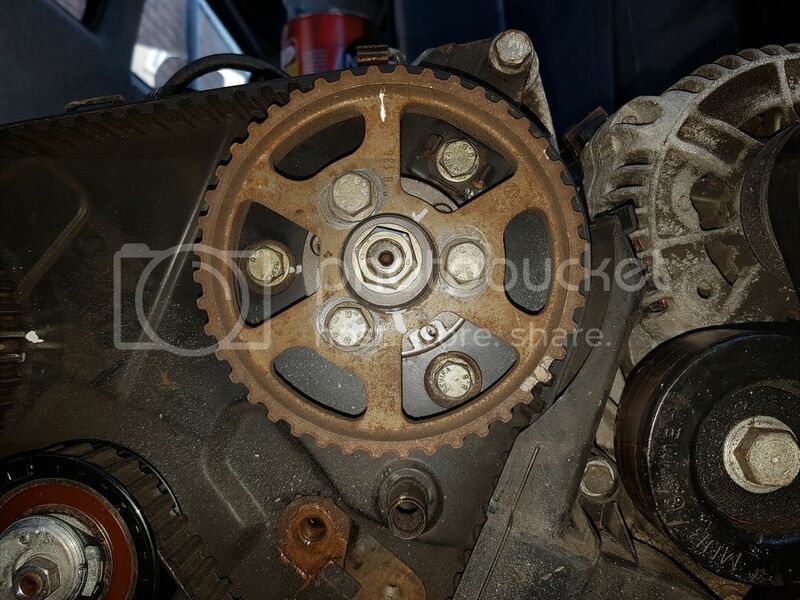 The engine won't start smoothly without it connected, and the timing correct. Stovies. Rotate the engine one full turn, then the pump pulley will be more or less as shown in my photo. Then follow the instructions in my thread exactly. That is the only way you'll get the timing right. 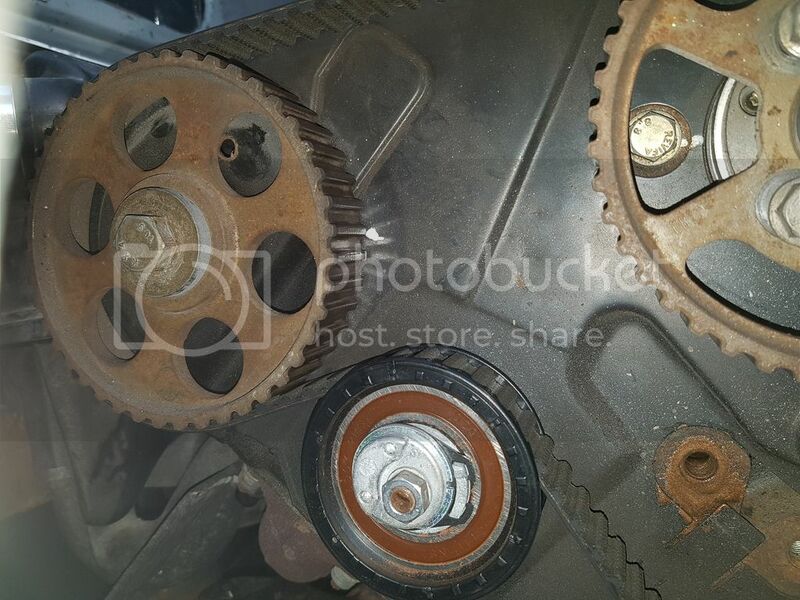 You can see from the shadow marks of the bolts on the pulley that the timing has been messed with many times. When the timing is correct the engine will work as you want. Same as my Bosch pump on the 1Y then, no cable on that originally just the solenoid - removed the solenoid and reverted to a cable. It does sound as though that solenoid is over advancing it though. But, glow plugs haven't been checked by the sound of it - leastways there was no response to the query. White smoke to start with is usually a couple of glow plugs gone and the other two are enough to start it. Last edited by Oldiebut goodie on 08 Jan 2018, 00:08, edited 1 time in total.